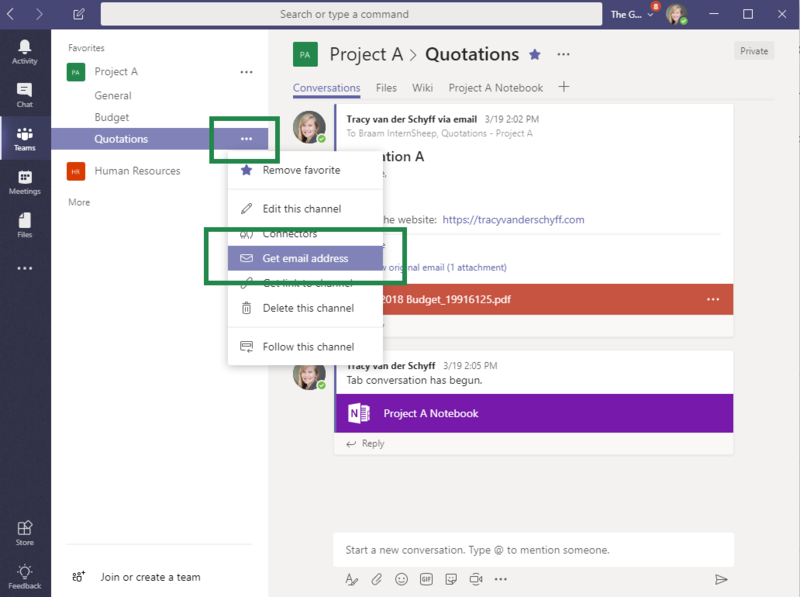 #Microsoft365 #Office365 #MicrosoftTeams When Teams got launched end of 2016, the industry was flooded with “When do I use what?” questions. Yup, I was one of them. For all of us it takes time to ‘own’ something and with that comes clarity and purpose. 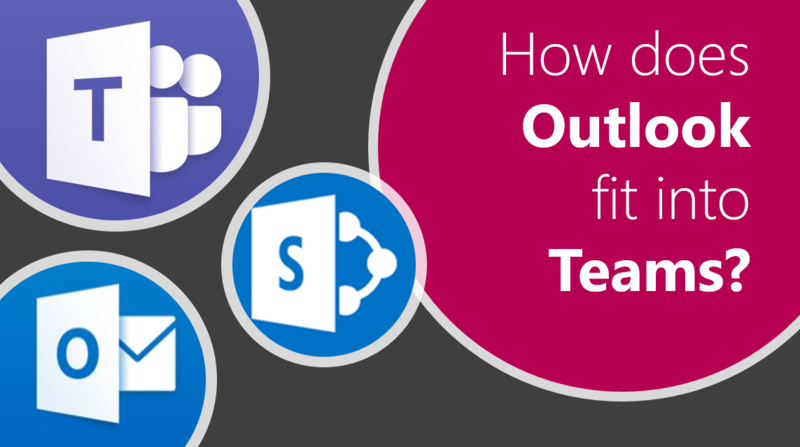 In this post I’d like to share my ideas around the purpose of Outlook and Teams in our everyday lives. Mail was invented in 1971 and quickly became the popular choice for communicating with people inside and outside of our organizations. Many people (like me) even send themselves emails as reminders. According to this article approximately 270 billion emails are sent everyday, on average an office workers receives 120 emails and sends about 40. I’ve moved way past the point of being able to read all the mails I receive and work on the “if it’s real important they’ll phone me or mail again” assumption. Many of these emails we receive daily, are from people we work with, sometimes the person sitting right next to you. To bring calm to the chaos people started creating crazy folders in their Inboxes to help them find stuff again. And we all know this doesn’t work so well either. A problem all users have struggled with for years, was too many tools in too many places. They had to leave Outlook to go to a browser and open SharePoint. Or log into a different system to log project tasks etc. Skype for Business gave us the opportunity to chat somewhere else (outside of Outlook), but finding stuff and threaded conversations just wasn’t that easy. Saving files could happen on their desktops, in their documents folder, on a file share or in SharePoint. No wonder they got frustrated with technology. This great App allowed us to bring many of our tools together in one place. And not by replacing them, but by incorporating them. 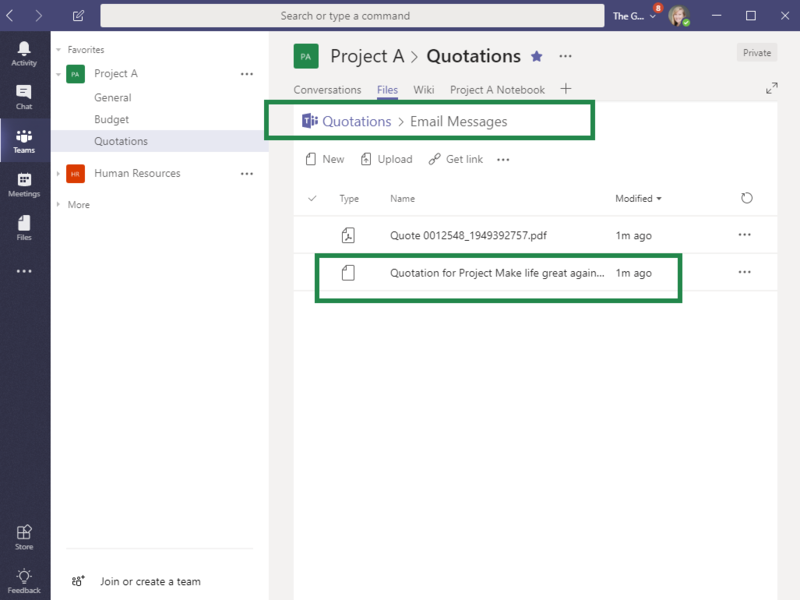 This left a question in many people’s minds – now what about Outlook? What if I need to send an email. The emails sent to the Group doesn’t show in my normal Inbox, rather under the Group etc. I’m part of a Project Team called “Make life great”. This is a group of people internally who on a regular basis communicate and share documents with each other. We also have weekly project meetings and have an issue and risk register and deliverable which leads to tasks being assigned to people. Recently we added two external contractors to the Team by using the Guest Access feature. In this Team, we have channels to focus our content and discussions: Administration, Budgets, Quotations, Issues & Risks, Resources etc. This really helps as I now know where to go, to find something. Occasionally we have to loop in other parties (internal or external) which does not form part of our Team. 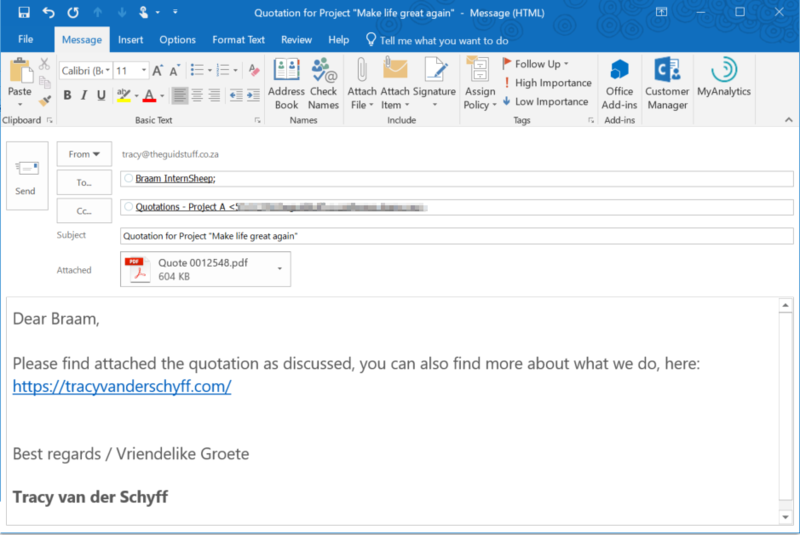 You might be sending a weekly report or request a quote or something similar. Now I know you can send the mail and cc the Group (which has a distribution list), but I prefer to do it in another way. 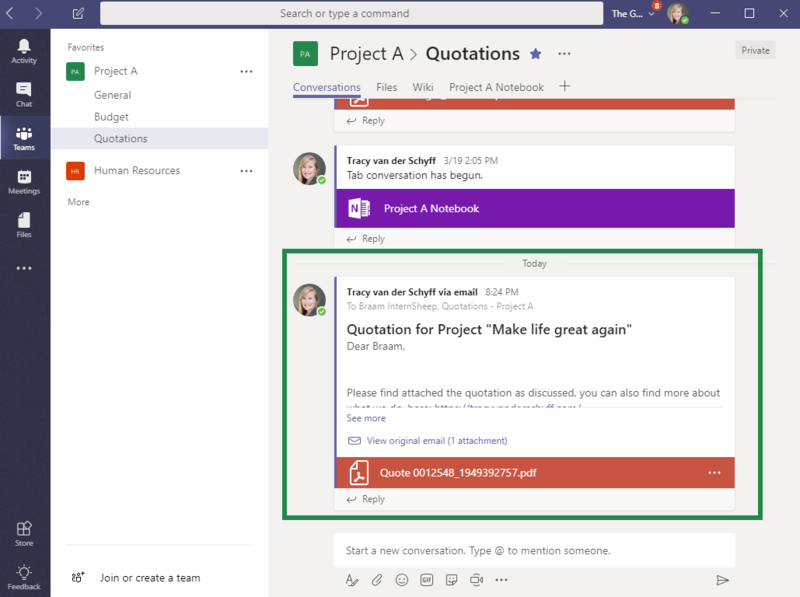 I would prefer keeping my Outlook for exception mails, mails that happen with people outside of teams I regularly work with. As mentioned, cc’ing the team also puts that attachment on SharePoint which is great and saves me a lot of time. Hope this helped to demystify some of your Teams questions. Good advice. I have seen some orgs create a Mail Contact for a channel email address, so it can be easily found in a Global Address List. One drawback of CCing the channel email is that every Reply All by people in the email conversation creates a new thread in the channel. I wish it was like Yammer where the emailed replies are kept together in the same thread.